We have enough Tempo Trainers for half of our top group to use them at the same time, so I devised this two-station set. The set in red is designed to use the Tempo Trainers to challenge their ability to hold Distance Per Cycle at race speed. The set in blue encouraged long, kick-driven strokes. 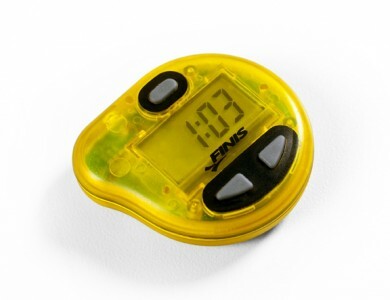 One of my favorite training tools is the Tempo Trainer from Finis. It is essentially a swimming metronome, giving an audible beep that can been heard underwater. Just tuck the tempo trainer under your cap near your ear, and you are good to go. You can get one at aquagear.com, who provided us a Tempo Trainer to use. 1. In the conventional way, to help a swimmer hit a certain tempo at practice. Here is an example. 2. For breaststroke, you can use it to help your swimmers hold their glide. Check out this workout from Coach Parker Ramsdell. 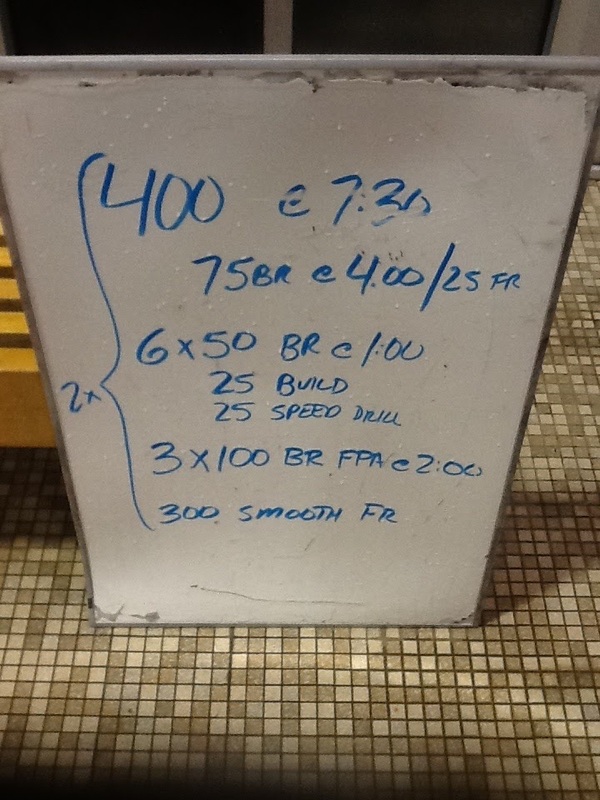 Here is another good workout for breaststroke. 3. You can use it as a sort of audible pace clock to help swimmers know when to start and stop an exercise like in this workout. 4. Try this: “The Beat the Beep Set“. Set the tempo trainer to beep on the swimmers time for a race pace 25. Then, the goal is to get to the wall before the beep! 5. You can use a Tempo Trainer in dryland — try doing some stretch cord work at race tempos. 6. For swimmers who have difficulty hitting fast tempos (most often distance types, in my experience) it may be helpful to have a Tempo Trainer set to race tempo and listen to it behind the blocks or in the ready room. Check out aquagear.com to get a Tempo Trainer and get this awesome tool! 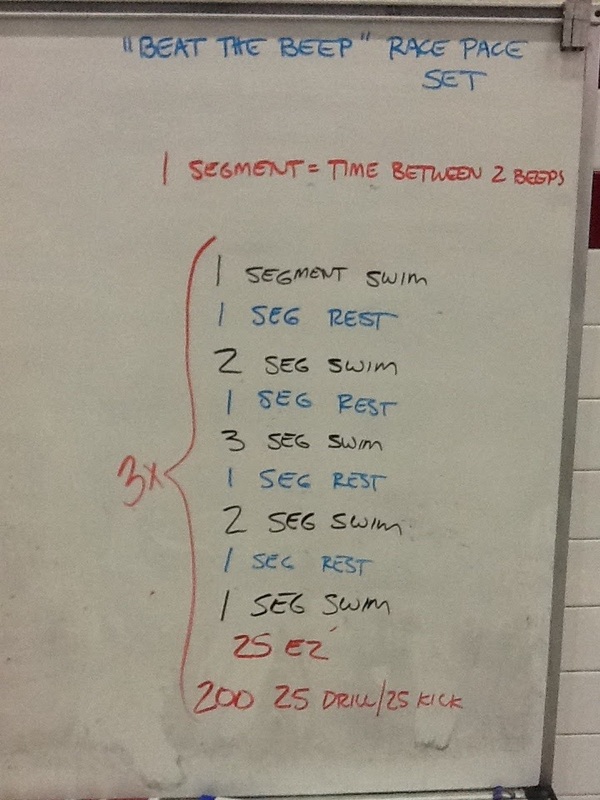 I did this set (SCM) with my breaststrokers yesterday morning and really enjoyed it. The 200s provided a solid aerobic touch to the training, and we’ve been really struggling with pullout discipline later in races, thus the no touch walls to put some extra pressure on the lungs on those underwaters. 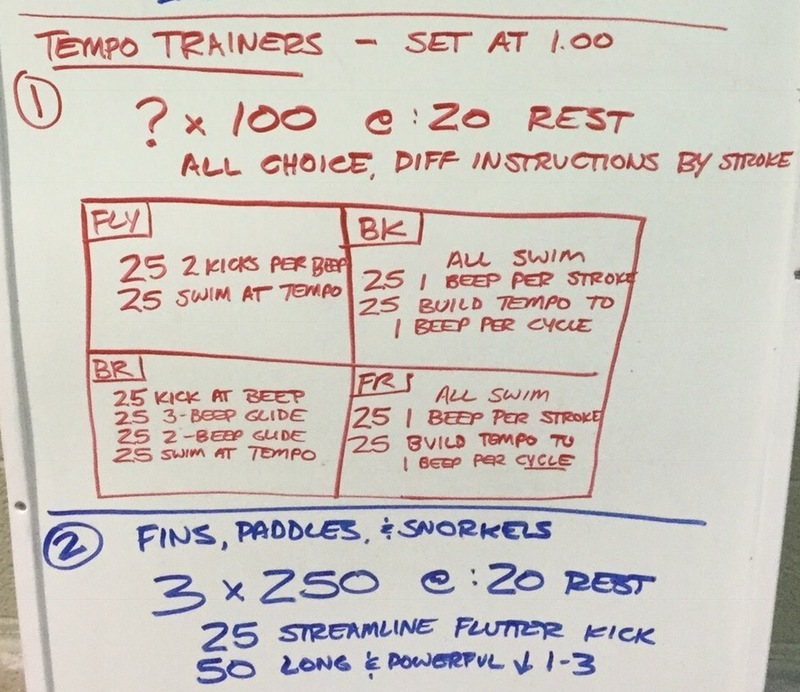 The 100s w/ tempo trainer set at 04:00 (25-1 stroke/beep; 50-2 strokes/beep; 25-3 strokes/beep) helped them work body line and glide for the first 75, then pick up the tempo on the last 25 helping prime them for the fast 50s to follow. We performed the set below with our sectional-level breaststroke group. There are essentially two parts to the set. The first part (above the dotted line) stresses technique with a LONG stroke and gradually builds to an up-tempo stroke at the end of the 100s. During this first part, “TT” stands for the Finis Tempo Trainer Pro which we use on a regular basis. Using mode 1, we have it set at 4.00, meaning the swimmer initiates a stroke once every 4 seconds. This is usually an uncomfortably long time to glide for our swimmers (a good thing!). 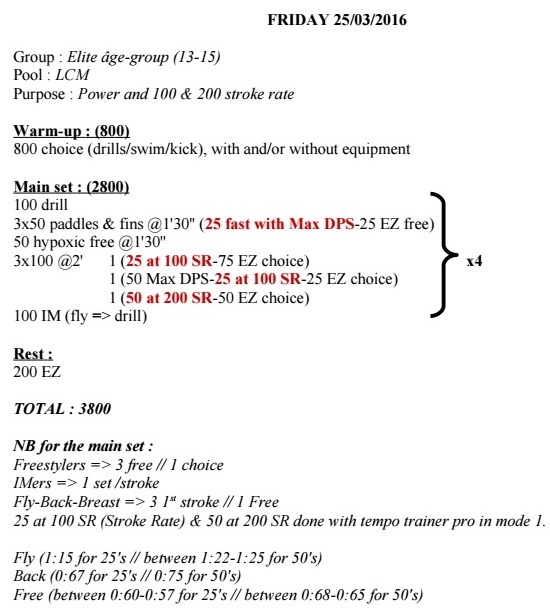 We bring the TT down to 3.00 for the 2 x 150 and then to 2.00 on the 100s and have the swimmers shoot for 2 strokes during the 2.00 seconds in the last 10-15 yards of each 100. This combination of technique and tempo sets them up well for the second part of the set. In the second part (below the dotted line), we are essentially challenging our swimmers in two ways on two sets of 6 x 100s. The first set challenges the efficiency of their underwater pullouts and breath-holding ability. The second set of 6 x 100 just challenges their endurance and the integrity of their stroke. The goal is simply to make all of the intervals and maintain stroke technique. 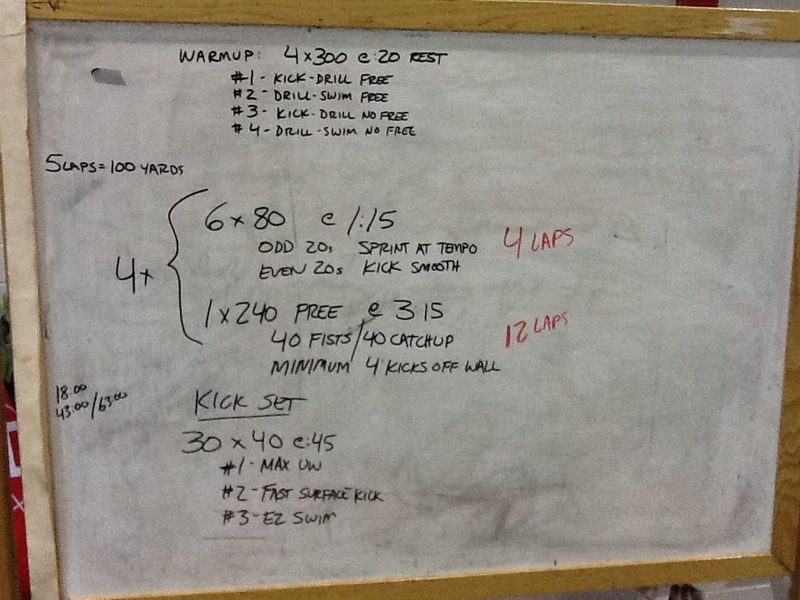 This workout was performed in a 20 yd pool. We did this set the other day with our age-groupers and it worked like magic. One of the most common stroke flaws for younger kids is that they pause with their hands under their chest and don’t glide long enough in a near-streamlined position. Try this using the Finis Tempo Trainer Pro. Swimmers take 1 cycle of breaststroke for each beep. This will be an incredibly long glide for them all. Make sure they spend the time in the glide phase and are using proper timing of the pull and kick. Same instructions, just a faster tempo. 2 x 50 breaststroke swim FAST (@:20 rest), focused on swimming fast but still getting a glide between each stroke. Do not use the tempo trainer here. If they don’t glide on the 2 x 50, repeat the 2 x 100 and then do the 2 x 50 again. Here is an interesting chart from FINISinc, detailing stroke tempos of elite athletes. The tempo ranges seem a bit narrow to me, and I question where exactly the data came from. Still, this could be very useful information. We set the Tempo Trainers so it beep at the 1/2 length and at the wall pace! The Goal is to beat the beep to the wall. Forces swimmers to get to the wall. 200 Speed and the 75 .25 slower than 200 Pace. 10 x 25 Tempo Trainer Go on 3Rd Beep FLAT OUT FAST! 10 x 50 Tempo Trainer Go on 3rd Beep KEEP THE SPEED! This set was written for backstroke, but it really could be performed any stroke. Today’s set utilizes the cycle count and tempo you can find with the Find Your Sweet Spot set. You’ll need a Tempo Trainer. This set can be performed any stroke. Here’s another way to use a Tempo Trainer for a distance set. Set your Tempo Trainer for an appropriate tempo for the following aerobic set. This should be significantly slower than your Threshold Tempo. Do as many as you want, and experiment with different tempos to change up the intensity. Set the Tempo Trainer for your 100 pace using this chart. Take as much rest as needed to make the pace. Beat your 100 pace to your feet every time. Set the tempo trainer to half of the desired 25 pace time. Set the Tempo Trainer for 7.5 and then leave on the beep and you will hear the beep at the 12.5/25/37.5/50 yards. Click here to see the tempo trainer pace sheet we use.